Fully powdercoated scratch resistant finish. 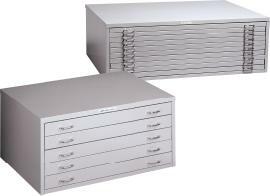 Hinged flap to front, and hood to rear, of horizontal drawers prevent drawings from curling. AO and A1 sizes available. Bases available to elevate cabinets. Capable of stacking on top of each other.